Brownies are easy to bake and tasty to eat. Brownies are healthier than pastries and cakes as they have lesser calories. Here we bring you two easy recipes to prepare for your Christmas and New Year's Eve. • Baking powder - 1 ½ tsp. • Baking soda - 1 ½ tsp. • Mix the curd and sugar till the sugar dissolves. Add baking powder and soda, mix and leave to rise for 10minutes. • Mix the flour and cocoa powder and keep it aside. • Add the oil and vanilla essence to the curd mixture and beat well. Add the walnuts and flour mixture, and fold well. • Pour on to a greased baking tray and bake for 30 minutes or so. You can check if it is done by piercing the centre of the cake with a toothpick or fork. It should come out clean. • Let the cake cool and you can serve it with vanilla ice cream (optional). • Baking powder - ½ tsp. • Vanilla extract - 2 tsps. • Preheat oven to 350 degrees F (175 degrees C). Stir the flour, baking powder, and salt together in a bowl. • In another bowl, stir together the olive oil, sugar, and vanilla extract; beat in the eggs one at a time with a spoon. Gradually add the flour mixture, and stir the batter until it's evenly moistened. Divide the batter in half in two separate bowls. • Into one bowl of batter, blend the cocoa powder. In the second bowl of batter, stir in the pumpkin puree, cinnamon, cloves, and nutmeg. • Spread ½ of the chocolate batter into the bottom of the prepared baking pan, and follow with ½ of the pumpkin batter. Repeat the layers, ending with a pumpkin layer, and drag a kitchen knife or small spatula gently through the layers in a swirling motion, to create a marbled appearance. • Bake in the preheated oven until the brownies begin to pull away from the sides of the pan, and a toothpick inserted into the center comes out clean. Cool in the pan, cut into squares, and serve. 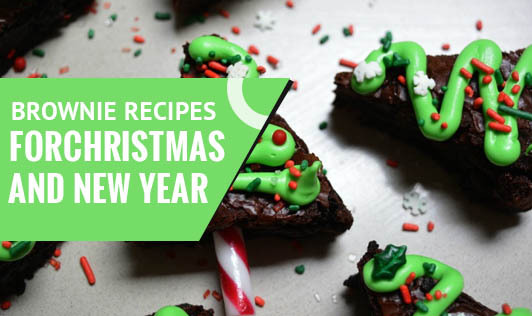 You may share your brownie recipes with us and we can give it a makeover. Go to "tools --> recipe makeover".